Q: 1 Samuel 28:6 says that King Saul “inquired of the Lord” but “the Lord answered him not,” so he went to the prophetess at Endor. However, 1 Chronicles 10:13 and 14 says Saul died because he inquired of the prophetess at Endor “and inquired not of the Lord.” Can you explain this apparent contradiction? A: The record in question occurs the night before Saul and three of his sons were killed in battle by the Philistines. In 1 Samuel 28:5 we read that when Saul saw the magnitude of the army of the Philistines he was afraid. Then he inquired of the Lord, but the Lord did not answer him. So he told his servant to seek out a woman with a familiar spirit that he might inquire of her. The apparent contradiction here stems from an error in translation. Although the word “inquire” is used in both instances in the English version, there are two different Hebrew words used in the Hebrew text. The word “inquired” in 1 Samuel 28:6, in which Saul inquired of the Lord, is shaal. However, the word “inquire” in verse 7, in which Saul seeks a woman with a familiar spirit to inquire of her, is darash. The word darash shows more intensity than the word shaal. These two verses are quite a commentary on Saul's head at this time. He was only willing to ask (shaal) the true God, while he was willing to inquire (darash) of the woman of the familiar spirit. The extent of the intensity of Saul's desire to seek an answer from the prophetess of Endor can be plainly seen with the aid of a map or a Bible atlas. The Philistine camp was at Shunem, at the southern foot of the hill of Moreh. This was six miles north of Mount Gilboa, where the Israelites were camped. 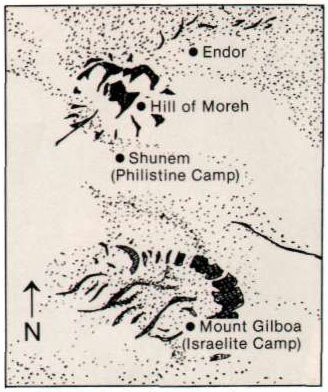 Endor was eight miles north of Mount Gilboa on the northeast side of the hill of Moreh. The hill of Moreh was the logical place for the Philistines to place a lookout. Saul was so intent on seeing the woman with a familiar spirit that he risked traveling around the enemy camp with its lookouts to get to Endor at the opposite side of the hill of Moreh from the main Philistine camp. When Saul met with the prophetess of Endor, she told him he would be killed by the Philistines, and he was. The record in 1 Chronicles 10:13 and 14 says he died because he inquired (darash) of the woman with the familiar spirit but did not inquire (darash) of the Lord. This agrees with the record in 1 Samuel in which Saul only inquired (shaal) of the Lord, but inquired (darash) of the woman with the familiar spirit.